Join Billy Molls as he guides his clients in North America’s premier hunting destination, ALASKA. Join Billy Molls as he guides his clients in North America’s premier hunting destination, ALASKA. 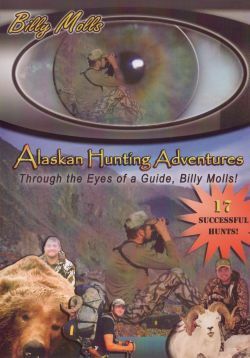 This DVD contains 8 years of footage from some of the most remote regions in the “Last Frontier.” Enjoy 17 successful hunts: 4 giant moose, averaging over 60”, 3 monster caribou, 4 Dall sheep, 2 wolves, and 4 brown and grizzly bear hunts. Watch as Billy’s father relives the tale of the grizzly he shot at 17 yards on a charge!!! Several Boone and Crockett animals are taken. This is the “real Alaska.” All hunts are shown exactly how they happened. If you have hunted, or dreamed of hunting Alaska, this 60-minute DVD is a must have.